It is a good news to share. 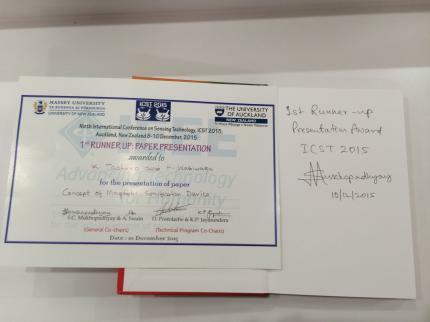 Prof. Kunihisa Tashiro, the head of this project, received an award, "1st runner up: papaer presentation" at Ninth International Conference on Sensing Technology, ICST2015, Auckland, Newzealand 8th-10 December, 2015. The presentation title was "Concept of magnetic sonification device", whose contents is a milestone for our magnetic energy harvesting project. 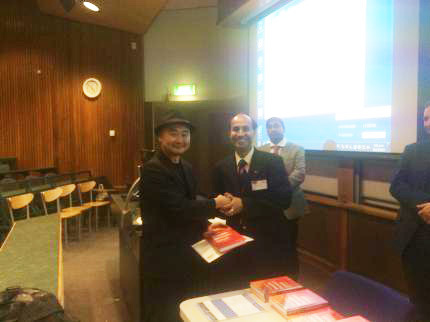 He also received　a book, Wearable electronics sensor for safe and healthy living, as a supplementary prize with signature of Subhas Chandra Mukhopadhyay who is the editor of this book, general chair of ICST2015 and one of our best friend ! Although Prof. Kunihisa tashiro have attended this annual conference, it is the first time to recive this honorable award.